HERKULES 450 saw conventional material division | BRAVO Loštice spol. 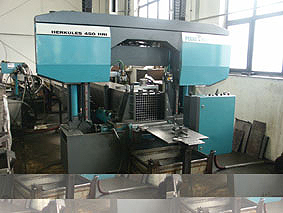 s r. o.
Semi-automatic, two-pole, hydraulicaly controlled band-saw HERKULES 450 HRI is highly efficient machinery for the division of non-metalic materials and hard-shapable alloyed steels, with no possibility of angle-cuts. The whole saw is constracted with the purpose to stand up the excessive effort in the production process. The saw construction enables the divised material to be anchored up to the size 450 x 450 cm (or diameter 450 cm) with the possibility of division of material in the packets with the precision guaranteed up to ± 0.4 mm.